If you are planning for a trip and need something to bring with you. Opting for the best duffel bag is a must do. These are bags that come in a larger size and are typically built to be a lot more durable than your average bag. These heavy duty bags are great for holding up in even the most extreme positions. For those who head into the great outdoors for a real adventure, this is the bag type for you. Fully waterproof you need not worry about your gear being damaged when using one of these bags. 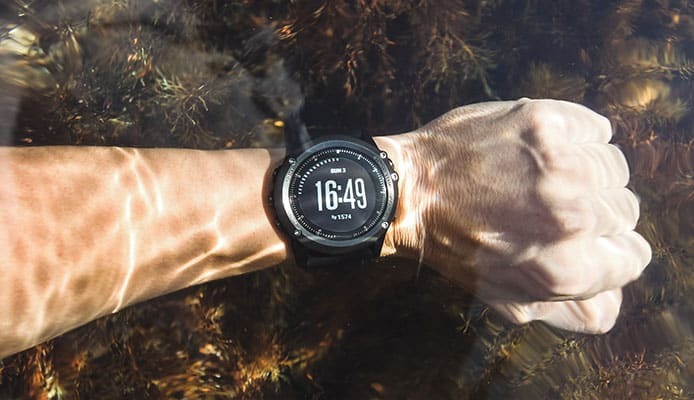 Many companies are watching on the sidelines as many outdoor enthusiasts around the world are taking to more extreme adventures. Committed to staying ahead of the game, manufacturers are more driven than ever before to create products to meet those needs. For that reason, you will find that you have many options. This means that you will get to enjoy high quality products. To help navigate the market, we have created a list of the best products on the market. Let’s just say you won’t be losing this bag any time soon. It comes in 6 great colors, one of which is a bright yellow. There are also 2 sizes you can choose from: 40L and 60L. 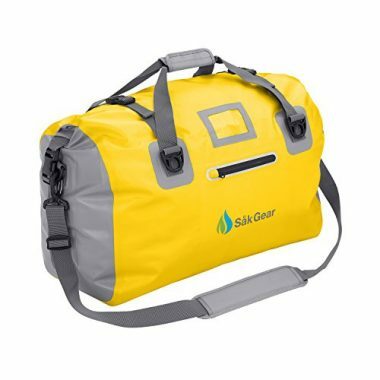 The great thing about this Såk Gear bag is that it’s 100% waterproof. It has a specially designed roll down top that lets zero water in. You won’t find a zipper seal as even the well designed ones are prone to leaking. You will also be able to throw this bag around without worrying about tearing or puncturing it. Såk Gear has used a 500D PVC material with welded seams. This means that it will stand up to everything Mother Nature can conjure up. You will also be able to store tons of gear in either size of this bag. No more will you have to pack light when you go on camping or kayak weekend trips. It even has an interior zip pocket and 2 outer waterproof pockets to keep essential gear close by. The cool thing about this bag is that there are many ways for you to carry it. It has a traditional small handle system, but also a shoulder sling and even 4 D rings to strap it to a boat. Aqua Quest waterproof duffel bag is an excellent way to transport your gear. 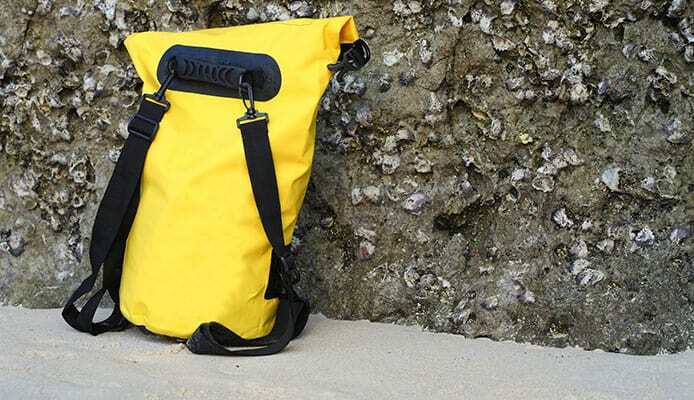 No matter if you’re scuba diving or paddleboarding you will love the added storage this bag gives you. But this bag isn’t just waterproof, it’s also snow, dirt, dust and even sand proof. You can bring this bag anywhere in the world and not have to worry about the contents. You won’t even feel the weight of the bag as it only weighs 2.2 lbs. This is due to Aqua Quest doing their research about materials and the overall layout of the bag. Instead of heavier material they opted for abrasion resistant Oxford 420D RipStop fabric with a TPU lamination and DWR coating. The bags stress points use a double bar tacked system while having welded seams. All of this creates one of the best constructed bags on the market. But all of this doesn’t matter if the bag is uncomfortable to carry which this bag is not. Its shoulder strap has a large pad and is completely adjustable to your body size and shape. There are also 6 D-rings strategically placed around this bag that the strap can fasten to. This means that you can change the way the bag sits on your body within seconds. If you don’t want to wear it over your shoulder you can even carry it with one hand. The bag also has loads of storage. There are 2 external rubberized mesh pockets giving you access to your important gear first. If you are backpacking you can even use the 4 webbing loops on the bottom to strap the bag to ensure it doesn’t fall overboard. Aqua Quest is so sure about their product that they include a warranty and a toll free customer service line for their customers. The warranty is a 2 year “no worries” warranty. This means if you have any trouble with the bag simply call them up and they’ll fix the issue. Kwik Teks waterproof duffel comes in two sizes: large and extra large. The large bag has a 70 liter capacity while the larger one has 110 liters of space. Both sizes are available in 4 different colors, all of which come with a reflective part by the handles. This makes your bag exceptionally visible no matter what time of day. All variations of this bag come with a nylon and polyester waterproof material. It has a roll down top which keeps water and debris out of this bag. The seams of this bag are also welded to ensure that no water has a chance to enter this way. Each side of this bag has a water resistant zippered pocket that has a storm flap. This is a great place to put snacks or other gear that can get wet and not be affected. The base of this bag has also been specifically shaped and molded so that it stands up even when packed more to one side. The base also has extra waterproofing so that you can set it down, even in a puddle, and be sure what’s inside stay dry. Carrying this bag is also a breeze. It has a removable, adjustable and padded shoulder strap that can make this bag sling over your shoulder or be carried in a more traditional way. The North Face is one of the leaders when it comes to outdoor gear. Their duffel bag is made from a laminated polyester material which makes it light and durable. The entire bag has been made in the USA and features a zipper closure. It sits 4 inches high and 13 inches wide giving you loads of space without being too bulky or oversized. The 95 liter storage space will make it easy to fit all of your clothes and gear for entire trips no matter how long you go for. It even has a zippered flap that is perfect for your toiletries. The interior has pockets for everything included wet clothes, dirty shoes or clothes that need to be laundered. The cool thing about this bag is that it can be carried like a traditional backpack. All the straps are configurable to your ideal carrying style. This can be a horizontal bag or slung over your shoulder. 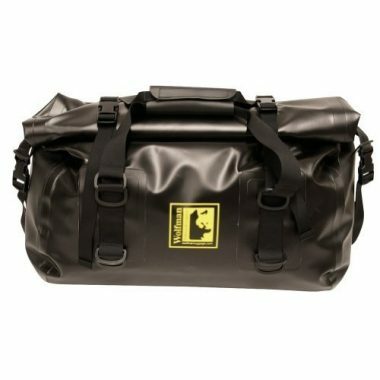 Wolfman isn’t playing around with their Expedition Dry Duffel Bag. Its body is made from 22 oz vinyl while the sides are beefier coming in at 34 oz vinyl. All the seams have been welded making this a 100% waterproof bag. You have a roll top flap that ensures all your gear stays dry while being easy to open and close. This bag is perfect for anyone. It can be thrown on a kayak or taken as a carry on in an airplane. You won’t have to worry about this bag being oversized when you’re travelling. It has 4 compression straps that ensure the contents are packed as tightly as possible. It also has 2 over the body straps that make this bag easy to sling over your shoulder, or worn like a backpack. The 47 liters of storage is a great size for a bag. It doesn't make it too heavy while giving you a large bag for your stuff. 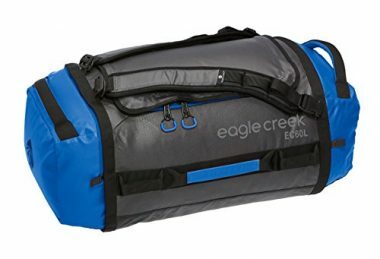 Eagle Creek has made one of the most stylish waterproof duffel bags on the market. The Cargo Hauler Duffel comes in 6 colors ranging from grey with orange accents to a blacked out color combination. It has been designed to be ultra light. This is done by picking a durable, water repellent coated bi-tech armor fabric which makes this bag nearly bulletproof. It also has bar track reinforcements on all the critical areas of this bag. This makes it rigid yet lightweight. There are 3 ways you can carry this bag including top handles, side handles and even backpack straps. Fabric D rings allow you to attach carabiners which make this bag even more handy. Even the zippers have been over engineered. They have easy to use pull tabs and even a place to add locks so your stuff stays secure. The Gage Tech Shackelton is a blacked out waterproof duffel bag. Even though it looks like an average pack it is definitely not. It has a 105 liter capacity that is protected by a 500D PVC tarpaulin fabric. This makes it not only waterproof but also super durable. It has a zipper closure that has been reinforced and specially designed to be water resistant. The welded seams come standard and add extra durability and waterproofing. Overall, the bag weighs in at under 4 lbs which is a sweet spot for duffels. When you don’t need the bag to be full it compressed down to only a few inches thick. 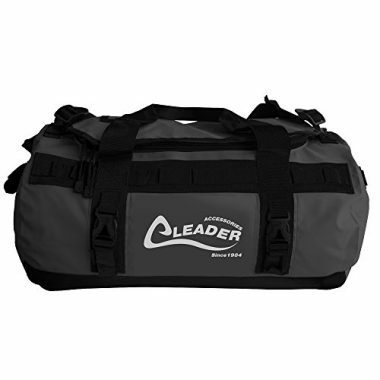 The Deluxe Water Resistant Duffel Bag from Leader Accessories comes in 3 sizes and 6 colors. This gives you complete control over not only the size of your bag but also its style. It has been made from marine grade vinyl and has high quality welded seams. This gives you peace of mind no matter what climate you’re in including dirt, dust, sand, snow and rain. There are two handles on all sides of this bag allowing you to carry it any way you want. When you’re in transit you can also use these straps to secure it to the ship or vehicle. All you need to do to clean this bag is simply wipe down the outer material with a cloth. Patagonia has a reputation for being a leader when it comes to outdoor gear. This Black Hole 90 liter Duffel Bag fits this description. It is made from 900D polyester ripstop, something nearly unheard of in the duffel bag world. But they don’t stop there. Patagonia have added a TPU film and a DWR finish. This makes the bag 100% waterproof. The 90 liter capacity is large but still easily carried. This is done by padded backpack straps that can be removed if necessary. Patagonia also understands that your gear needs to stay safe. This is why they have added padding to their base. Not only is it completely waterproof, but your laptop and camera gear won’t get damaged even when accidentally dropped. The internal organizers and zippered mesh pockets will also be able to effectively organize all of your gear. 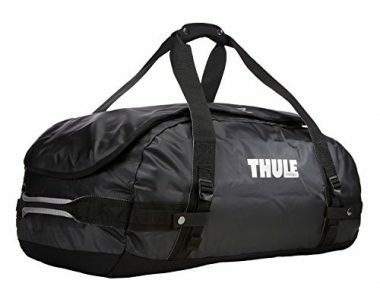 Thule is well known for their roof rack systems but should also get credit for some of the best waterproof duffel bags. They know the importance of having a large opening and how it makes packing so much more manageable. All of the bag’s straps can be quickly and easily removed and can be turned into a backpack in seconds. It has been made out of a tarpaulin fabric that ensures a waterproof and durable encasement of your goods. This also means that you can easily fold it when you’re not using it. If you are needing your gear to fit a smaller area you can use the external compression straps. Before you get too far in your search for your next duffel bag, it is important to have a thorough understanding of what is on the market. For that, you will have to understand the different features that are available on the market which will allow you to choose which ones are important to you. Knowing how to properly navigate through the market can help you save a lot of time and money. When making your next purchase, you will want to consider the following. 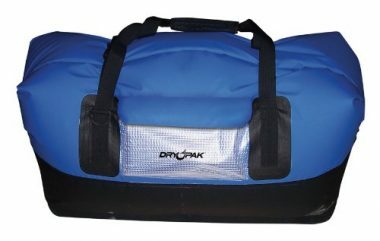 Waterproof duffel bags are some of the most versatile types of bags on the market. They are large enough to carry absolutely everything in one bag, but are small enough to carry easily. These bags can also be used by nearly every type of person. 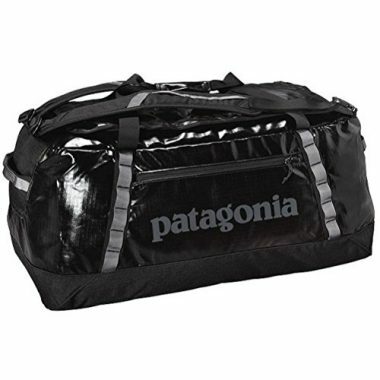 You can throw this bag in the trunk of your car and use it for simple trips to the gym or treks through the mountains. 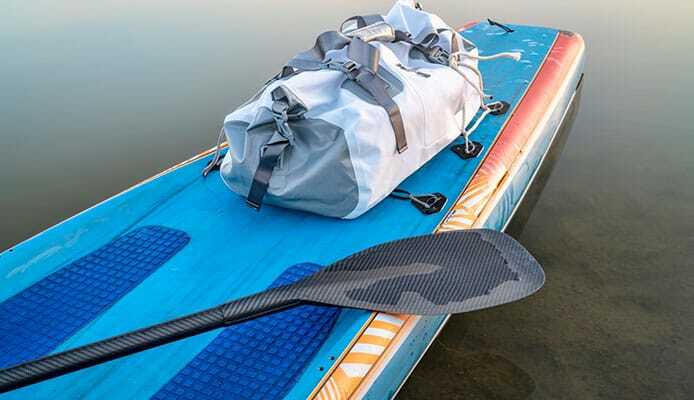 These bags can also be used on kayaks and even paddleboards to keep your gear dry. Outdoor enthusiasts will appreciate this versatility. There is virtually no watersport these bags won’t be able to handle. You can strap them onto a paddleboard or kayak with their bungee systems or even strap them to speed boats to ensure they don’t fly away. The cool part about these bags is that they can be used for more than just intense situations. You can load them so that they are still able to fit as carry ons for international travel. They also have straps that make them ideal bags to strap to motor bikes while being able to ride through every type of weather. If you are into skiing, cycling and even hockey you can use these bags to store your gear. This is also true about camping and hunting. No matter what situation you put them in they will meet and exceed your expectations. Why Get a Duffel Bag? The biggest reason so many people turn to this rugged style of bag is their beautiful versatility. Whether you are skiing on the alps, backpacking through Thailand during monsoon season or out for a day of ocean kayaking, these bags will hold up. These bags are perfect for all outdoor activities whether you are dealing with a drizzle of rain or complete submersion in a lake. These bags are ultra durable typically made from a thick material that is built to last. The size of bag you choose will vary largely based on use. If you are planning to use your bag for a weekend getaway or as a carry on bag, opting for a small or medium sized will be more than enough. If you are planning for a more substantial trip, you will need something a little bigger. An extra large duffel can be as big as 130 liters in size. This will likely carry everything you own. This is likely more than you will ever need (or comfortably be able to carry). We recommend going for a 90 liter for those times where you are going on extended trips. This style of bag is ideal for providing you with ultimate protection, no matter the situation. Coming with shoulder straps, you are sure to love that this bag can be worn comfortably on your back for easy transport. This means that you can bring your bag with you to even more places. You may be wondering whether you need all the advanced technology of a fully waterproof duffel. While there are many advantages to consider with this style of bag, there are also many drawbacks. The biggest most obvious advantage is that this style of bag is rugged enough to provide superior protection from water damage. Whether you are looking for protection from harsh weather or from lakes and ocean. This makes them the ultimate option for those looking for an all around bag. Whether you are hiking through monsoon conditions or white water kayaking, you can rest assured that your bag will hold up against it all. This works to make you safer as you will not have to worry about your gear getting wet. Wet clothes are the number one cause of hypothermia. Ensuring that your gear stays dry can be life saving. The size of waterproof duffels can also vary giving you ultimate control of what bag is right for you. 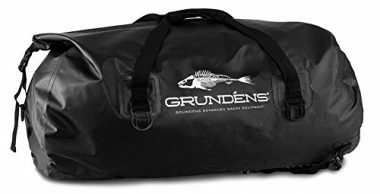 Ranging up to 120 liters in size, these bags are large enough to hold all the gear you may want to bring. On the other hand, these bags hold one great disadvantage: organization. Many people, especially travelers, enjoy a bag that has separate compartments for easy organization. This is incredibly useful in providing a separate safe space for things such as electronics and toiletries. While this may seem unimportant, it can be quite frustrating. This is especially true when you are using your bag for long term travel. While most duffels come with straps that make them quite comfortable to wear, they are not intended to optimize long term use. This is because they lack the abdominal strap that most waterproof backpacks feature. This puts the full weight on your shoulders. Additionally, this style of bag often has a very outdoor look that doesn’t transfer as seamlessly to finer conditions. While ideal in use, they have a bit more of a rugged industrial look than you may want. There are many factors that make a great bag. One of the main things to look for is the size. A large 110 liter bag will not suit your needs if you just need it to store a beach towel, some sunscreen and a hat. It’s best to think about not only what you’ll put into it but what situations you’ll use it in. Sizes can range anywhere from 20 liters to upwards of 140 liters. These will be vastly different not only for uses but also when transporting. One way you can get around having an oversized bag are having compression straps. These essentially sinch in your belongings to ensure the bag doesn’t get too large. This way you can get a larger bag without having loads of extra space. If you plan on using it for international travel you should check with your airways about carry on size limits. It’s best to know ahead of time rather than having a packed bag denied entry onto the plane. Great bags don’t have to cost an arm and a leg. With that being said, a $200 option will be much more reliable than a $40 one. After all, you get what you pay for. The materials they use should be top of the line while the construction should make your life easier. Keep in mind that a higher upfront cost may actually save your pocketbook in the long run. There’s something to be said about not having to replace a bag every 6 months. The materials of the duffel bag will dictate how well your belongings are protected. If the bag has an excellent outer material but lacks welded seams it could let water seep in. We strongly suggest looking for a waterproof bag rather than a water resistant one. This will ensure your belongings stay completely dry. If your bag has zippers you should also ensure they have been properly sealed as well. This is one of the main ways water enters the bag. Most companies only use zippers on outer pockets rather than the main one. A poorly designed bag can actually make your travels more difficult. If the bag doesn’t have pockets or straps it can be hard to organize your stuff and carry. You should look for a bag that is specially designed for what you’ll mainly use it for. If you are looking to bring camera gear along while you kayak or paddleboard you may need internal compartments to keep it all organized. Even though these bags aren’t designed to be carried for long distances they should still be comfortable. This is done by having straps that have extra padding. Rubber handles will also make your hands happy as it reduces the stress put on them by the weight of the bag. An often overlooked, yet vastly important, aspect of a duffel bag is the straps. They should have more than one type. For example, a bag should have a shoulder strap along with smaller handles and even a way to wear it as a backpack. The outer dimensions of a duffel bag will dictate what you can use it for. This will be a great way of determining the size of bag you need. For example, if you’re wanting to use it as a carry on for an international flight you’ll need a different size that if you’re using it for scuba diving. Since these bags are simply a waterproof material and don’t usually have padding, they are a similar dimension to the capacity. Each bag will come listed with an intended weight capacity. This number is the maximum amount of weight that the bag can support. While this is important to stay within for any type of bag, it is important to pay strict attention to this number when it comes to waterproof bags. If you pack your bag exceeding the weight limits listed, you run the risk of your bag not having the same waterproofing coverage as it is designed to have. This is because the added weight can cause added strain on seams and zippers causing it to break. This could, in turn, decrease the integrity of the waterproof seal. For this reason, it is wise to consider the weight capacity when looking at the volume allowance of your bag. Packing your bag with excessive weight will cause the integrity of the bag to diminish. This will cause your bag to break prematurely reducing its lifespan and costing you more money in the long run. You may be wondering how size and volume differ when it comes to your waterproof duffel. The volume of your bag will most often be measured using liters. This refers to the amount of gear that your bag will be able to carry. While you will find many bags in the 30-80L range, there are also some high capacity bags that are equipped to hold more impressive volumes of up to 130L. This is one of the most important features of your bag. You will need to be able to fit all of your gear with you. The amount of gear you have will help to narrow down your search and give you a focal point of which bags will best suit your needs. It is important to note that the amount of room you need is subjective. Just because your friend has an 60L bag, doesn’t mean that this is the size that you need as well. When looking at the volume of your bag, it is important to keep in mind that bigger isn’t always better. If you are a traveler, keep in mind that there will be size restrictions in order to bring these bags on a plane. This is especially true if you are looking to bring them on as carry on luggage. For bags with bigger volumes, be sure to consider the weight that your bag will carry at full capacity. While having a 100L bag may allow you to bring all your gear along, it will be virtually useless if you can’t actually lift it. While choosing the color of your bad may be an afterthought, something that you don’t pay as much attention to, it can hold some relevance in your decision making. While we recommend placing the biggest priority on the bags features, it is not entirely accurate to say that the color of the bag is purely cosmetic. In fact, it depends largely on the type of activity you are doing. After all, if you are trying to use a neon yellow duffle bag for hunting, you may experience some problems. The ideal color of your bag is directly related to your intended use. 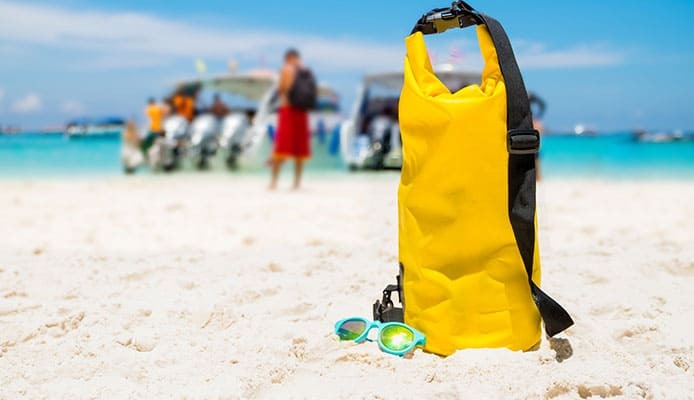 For those who are using their bag for any marine type use, such as kayaking or paddle boarding, going with a bright neon colored bag is wise. These bags offer high visibility. This is great for helping you to accurately locate your bag and increases your visibility on the water. As most marine gear comes in high visibility yellows and oranges, these bright colors will not look weird out on the water. 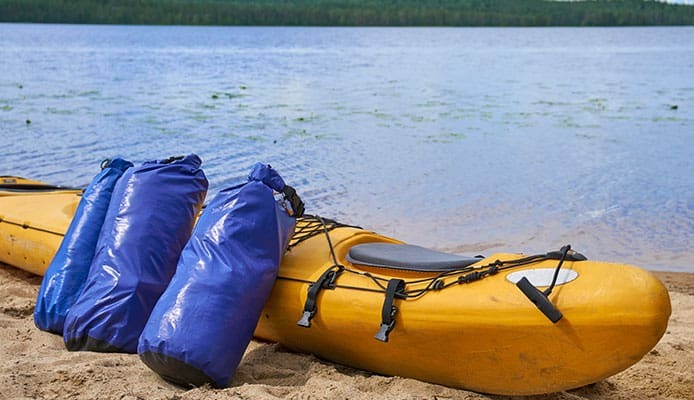 For those using their gear for dry land recreational use such as backpacking or camping, going with a more neutral colored bag is often preferred. While having a high visibility color can still prove quite effective, it is far less necessary. This is especially true if you find yourself in the woods for things like hunting. Here, you will be best off with something in a black, green or brown color for better blending. These are vastly different things. Waterproof means that the contents of the bag will simply not get wet under any circumstances. The bag could be submerged in water and still maintain this. Water resistant on the other hand means the bag can withstand getting wet. This means a rainstorm rather than a plunge into a river. Zippers can affect the ease of access you have to get at your belongings. Some have a single zipper at the top of your bag which makes it hard to get to the bottom. A D shaped zipper is ideal as you’ll be able to access all of your belongings without having to dig through the bag. Just keep in mind that zippers reduce the waterproof seal of the bag. Look for bags that specifically state the zipper is waterproof. Duffle bags all tend to carry a very similar recognizable look. With very little variance, you will notice a difference only slightly with varying brands, mostly in color and straps. In these bags, the biggest difference will come from whether the bag is of the traditional design or features wheels. Wheeled duffels are more of a new design feature in this style of bag that has rapidly gained popularity. Each bag type tends to come with their own advantages making them both appealing for different reasons. The choice between the two really comes down to personal preference. 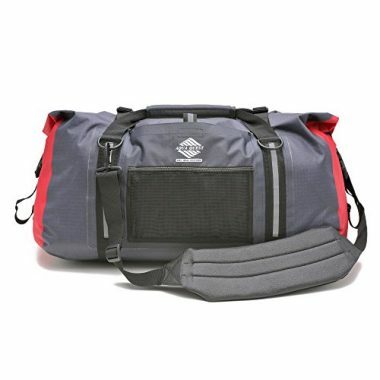 The more traditional style of duffel bags come with small handles for hand held carrying, or with a long strap that can loop around your shoulder or across your body. This style is one that you are sure to not overpack with as you will have to carry that weight. The ideal waterproof duffel bag should have as many pockets as possible. This will allow you to organize your gear effectively. If you are a photographer, for example, you could have a pocket for your memory cards and small items and another for a wallet or cell phone. This can be an effective way to isolate small or breakable items. Some of these bags will even have zippered interior pockets. This ensures the items you put into the pockets actually stay there. It is also a great way to make your valuables more secure if you’re traveling in a less safe place. Other bags have exterior pockets as well. Most of the time these are zippered which makes the pocket water resistant rather than waterproof. You should keep this in mind when you’re considering what to put in them. If you need something to stay watertight you will want to look at a bag that has internal pockets. There are a few different styles a waterproof duffel bag can come in including knapsack, wheeled or even multi strap options. When you’re trying to look for a waterproof bag you’ll want to explore the option of the kind of style you’re looking for. If you’re a person who likes to backpack with lots of gear a backpack style will suit you best. This type will have straps that allow you to carry it as a backpack and may even have a waist strap. Features like this will make it more stable against your body and allow you to walk without feeling the effects of the added weight. A wheeled bag will look similar to that of a carry on bag. It will have 100% waterproof material with wheels and an extendable handle. This will be for people who have sensitive cargo that need it to stay perfectly dry. But at the same time, you’d be able to use it as a carry on as well. This way it’ll replace your carry on and make it more versatile allowing you to bring it with you to more places. This is a big factor you should consider before you purchase. 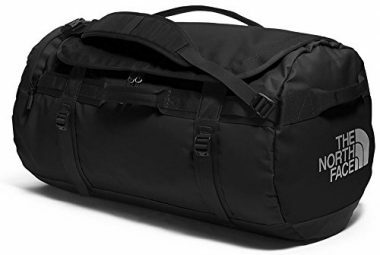 If you are going to use this bag to travel through the Amazon you’ll need a vastly different waterproof duffel bag if you’re an international traveler staying in hotels. A: It doesn’t matter what you’re transporting, you will want what’s inside your bag to be dry. You could be kayaking through rapids or portaging a canoe through the forest a duffel bag will give you peace of mind that your gear is safe. This is especially true if you’re a photographer or want to bring along a laptop. These pieces of equipment can cost thousands of dollars to replace if they get wet. Even though duffel bags can cost more than regular ones, you won’t have to fork over money to fix or replace the gear you’re carrying. A: Who isn’t a duffel bag for? Even if you are just walking from your car to the gym you will want what’s in your bag to stay dry. You don’t have to be on a Mount Everest climb or a trek through the Amazon Rainforest to appreciate dry clothes and gear when you get to your destination. We recommend everyone has at least one duffel bag on hand for their everyday needs. Q: How To Clean My Duffel Bag? A: There is no hard and fast rule about how to wash all duffels. Those with waterproofing technology will require a gentle wash and are most often not machine washable. Due to the waterproofing material, they are however quite easy to wash by hand. Machine washing can be harsh and break down some of the technology in the bag. Likewise, extreme heat such as that in a dryer can harm and even melt the bag. When looking to wash your duffle, the safest way to do so is to take a wet cloth and simply wipe down the sides. This will allow you a good opportunity to spot clean any areas of concern. We recommend staying away from soaps and cleaners for this but a small amount of diluted vinegar can be used if needed. For drying, be sure to hang your bag in an area that is out of direct sunlight. The extreme heat of direct sunlight can be damaging to your bag. Sprinkling some dry baking soda in the bag and vacuuming it out is a great way to get rid of odors. Otherwise, fabric fresheners such as Febreze could be used to help banish odors. A: This is an important question to consider, especially for those who have a tendency to overpack. When we say stuffable, what we are really meaning is will you be able to overfill this bag stuffing every last piece of gear inside to the brim and have the zipper still close? Will you still be able to comfortably carry it at this stage? Will it still have its waterproof assurance? You want a bag that will be able to work for every situation. For this reason, you want a bag that will be able to handle the amount of gear you need to bring. Being able to comfortably carry a stuffed bag can be a great convenience. The level of importance for this feature is directly related to how heavy of a packer you are. In most cases, you can tell how stuffable your bag is going to be based on the shape of its zipper. Zippers that are straight tend to have less flex than those in a D shape. Not only does D shaped zippers provide better access to your gear, it also tends to be a bit more forgiving with extra gear. If you are an over packer, going with a duffel with this style is a wise option. Q: How Should I Store My Duffel? A: For those times that you are not using your duffel, it is wise to store it in an area with a bit of space rather than crumpling it into a ball in the back of your closet. Laying your bag flat and out of direct sunlight is the best way to store your bag. Be sure to do so in an area that is away from extreme heat. Every outdoor enthusiast or traveler has a use for a duffel bag. They are excellent for not only transporting your belongings but doing so safely. 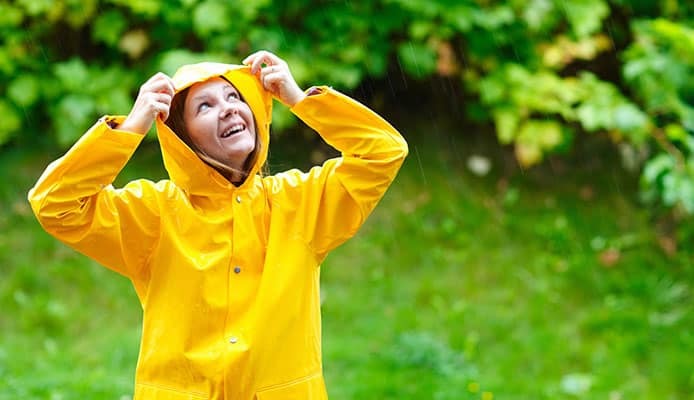 You will love that you can rest easy knowing that your stuff will stay dry, no matter the conditions. These types of bags can be used in every situation from trekking through rainforests to carrying important documents for work. You don’t have to be a world traveler to appreciate what these bags are capable of. Have you ever tried a waterproof duffel bag? Tell us about your experience with it in the comment section below.